Had a big week, and it really doesn't take long to make them. But it was all I could do to finish the last one. I did use size 80 thread to achieve the look I wanted. Had to only place one yellow bead in center of each clover instead of three. Now to make another :) Thanks for the free pattern I really enjoyed making this and it was easy to understand too! click on her name under first picture to go to her blog if you haven't already! I finally finished the "all rings doily" and found that the winter crop looks so pretty that you might like to see this too. The church across the street from me has a neighborhood garden and they have a final winter crop and have even harvested some of the beautiful cabbage and above is broccoli. It is 70 degrees Fahrenheit here, and that is warm, but the average for October. My camera was not quite catching the pretty green but this is so pretty and big had to show you! Some pretty flowers that seem to actually look like same color. This flower I can't remember the name was much more magenta here it just looks red, but still pretty. If you live in neighborhood you can get a row (to grow what ever you like) for your family, and all they ask is that you give a certain percent to the needed people store down town. Little Guy That Needed a Gecko. 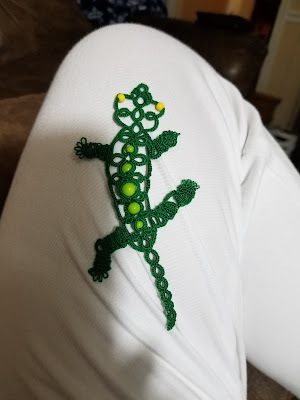 Had fun with one of the many free patterns from Jane Eborall's blogspot I did find some graduated beads to place in the back (Did add more double stitches to to larger beads.) and sent this to my grandson. Then on the final round I just started, I made a mistake so I had to snip and start that last bunch of rings again. !